HELENA, Mont. (AP) — Democrats questioned Thursday whether U.S. Senate candidate Matt Rosendale illegally coordinated with the National Rifle Association based on an audio recording of the Montana Republican saying the NRA planned to support his campaign. Rosendale spokesman Shane Scanlon called the accusation baseless and said Rosendale only discussed the NRA's endorsement with the gun-rights group, which is legal. An audio recording posted by The Daily Beast appears to capture Rosendale saying that he expected the NRA and the U.S. Chamber of Commerce to enter the race against Democratic U.S. Sen. Jon Tester in August, and that he had spoken with Chris Cox, executive director of NRA's Institute for Legislative Action, the group's lobbying arm. Rosendale's comments came in response to an unidentified speaker's question, asking if outside groups started spending on his behalf. "I fully expect that the U.S. Chamber is going to come in, and I fully expect that the NRA is going to come in," Rosendale says on the recording. "I think both of them will be coming in probably right here in August sometime." "The Supreme Court confirmations, that's what sent the NRA over the line. ... Chris Cox told me, he's like, well we're going to be in this one," Rosendale added. The Daily Beast reported the recording was made by an anonymous source in July during an event in Washington D.C. On Sept. 6, the NRA announced it was launching a "six-figure TV ad campaign" supporting Rosendale and blasting Tester's past votes for Supreme Court justices Elena Kagan and Sonia Sotomayor and against Neil Gorsuch. Officials from the Tester campaign and the Montana Democratic Party say the recording raises questions of whether Rosendale and the NRA coordinated the ad buy with the campaign, which would be illegal under federal law. The Federal Election Commission says illegal coordination happens when a communication is made in cooperation, consultation or at the request or suggestion of a candidate or a candidate's agent, committee or political party. 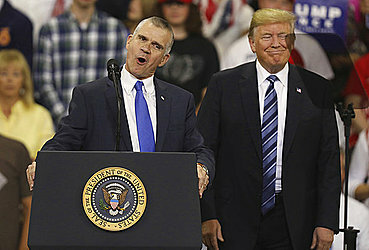 Tester campaign spokesman Chris Meagher said the remarks suggest Rosendale was at a minimum "playing fast and loose with campaign finance laws." Scanlon confirmed the voice on the audio recording was Rosendale's, but said the allegation of illegal coordination was a desperate attempt by Tester to keep his seat. "The only thing this audio proves is that Matt sought the endorsement of the NRA — and we're proud to have it," Scanlon said. "Matt and the NRA have never discussed anything beyond the organization's membership and endorsement process. " NRA-ILA spokeswoman Jennifer Baker also denied campaign coordination by her group. "At no time did NRA-ILA discuss any communications or activities beyond our membership with Matt Rosendale or his campaign. Any assertion otherwise is completely false." The NRA is one of several outside groups that have poured tens of millions of dollars to influence the outcome of the Montana Senate race, which is one of 10 in the nation this year in which a Democratic incumbent is seeking re-election in a state won by President Donald Trump in 2016. The outcome of the race could help determine whether Republicans retain control of the U.S. Senate. Rosendale received the U.S. Chamber of Commerce's endorsement on Aug. 17 but the business organization has not bought any television ads supporting Rosendale or opposing Tester, according to FEC and Federal Communications Commission records.